Actually, it should be "--with-default-mixerapp=defaultaudiomixer"
OK, I will compile it. When attempting to set the time from a server it gets it wrong every time. It has set the time to the 3rd of this month, early afternoon 10 times this morning. I do not know a thing about that kind of software on Linux (never had a use of it before the Raspberry Pi). I did try all the servers you include to be sure of error. I am using RPI2 as my desktop; switched across from Raspbian as soon as BarryK added LibreOffice to his Quirky 8.0.25 alpha (thank you for this Barry). Quirky is an excellent and full featured desktop environment. There are other advantages of Quirky/puppy/fatdogARM like being able to easily mount/unmount various USBsticks on the rpi. Plus all the great info on this forum. 2. Reboot pi and then open Menu>System>Boot Manager configure boot up. 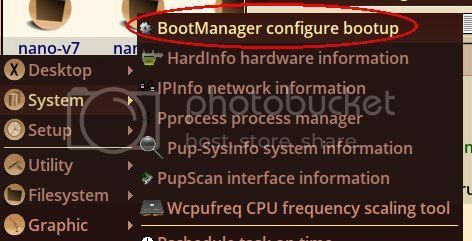 Click on the “..services to run at boot..” icon. Ensure “ntp” is ticked in the boot manager list of things to start up on boot. FYI, No 1 gives the rpi a fake clock and remembers the last time you logged off, since the rpi doesn’t have a built-in system clock. No 2 & 3 start the ntp service and retrieves the date and time from the ntp server/s you have listed in the ntp.conf file. No 4 tells the ntp service not to panic if the time is too big a difference (I think?). Which I tried recently, it doesn't seem to work. ...version 2.10 is posted on page 8 of that forum thread. Maybe, if we can get Internet time sync sorted out, Quirky will be ready to be announced on the Raspberry Pi forum. Though, my SimpleVLC is rather immature, only able to play local files. It is actually quite a simple script, the structure is in place for adding more features, and someone might get inspired to add more stuff like Internet streaming. Was reading the docs for Psync, discovered that the 'ntpdate' utility, required by Psync, is missing. The 'ntpdate' DEB is included in the build, however woofQ expected the utility to be in /usr/bin, whereas the DEB has it in /usr/sbin, and it got left out of the build. Fixed. Hopefully, Psync will now work! Oops, I jumped the gun by a couple of days. Sorry. So if not to much to ask, and you think enough people would use them would it be to much to ask for these to be put in the Repo to be available form PPM? 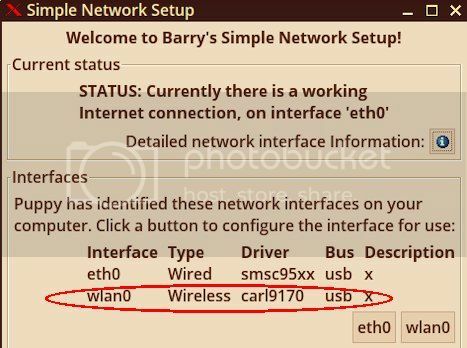 Here is how I connected to a home network , linux or Windows. Plug in my USB wifi adaptor to pi2 board. Fortunately my adaptor allows hot pluging. 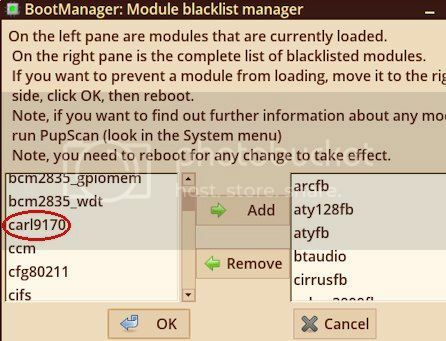 Right click on network tray icon to configure the settings. A list of networks available is shown. Choose your home wifi network and security protocol(WPA) and password of your home wifi network. The connection should take about 15 seconds. Use YASSM share search to search for a SAMBA or Windows share folder. Click 'Select' icon. If everything went well then the share folder should pop up. Drivers that are loaded are on the left side. Thanks for posting all the necessary steps. Unfortunately, in my case the connection never happens. My wifi driver is listed and loaded. Don't worry about it, I will use a wired connection for now, and let this matter sit until I will really need a wifi connection, which won't happen for another a couple of months. The main issue I think is that the new SimpleVLC is too simple. Only plays local video and audio files. Oh, just now testing 8.0.98 on the Pi3, OpenMAX hardware accelerated video is not working, only get sound. I will try again with the Pi2. It was working on the Pi2, but that was version 8.0.27 with some improvements, and perhaps different firmware from 8.0.98. That last line will run SimpleVLC. Choose "OpenMAX" video output, then play a video, it should play full-screen. Getting distinctly heavy for a little RPi guy to handle at ~360Mb .img ! Doing all that singing & dancing costs in terms of real estate. Not to mention the need of watching the heat dissipation/install optional heatsink. Strikes me there's room for a slim-Quirky ~150Mb, perhaps with extra careful app selection and no default options, just PPM? Who's the clever guy on this suggestion? or will we have to leave it to the maestro again? It is easy to remove extra packages in Puppy Linux, one of its great qualities. And ~500MB on disk makes this one of the smallest Distros for the RPi (not as small as the x86 puppies I remember weighing in under 90MB). I think the biggest part of that is Open Office, i think that is something like 150MB by itself, and I do prefer AbiWord. 8.0.98 is great. Though so far I have not yet gotten VLC to play video yet. I can get to the first frame, though that is it so far, and yes I have the gpu_mem=256 on my config.txt. This is on a Raspberry Pi 3B. I am wondering if it has trouble with the hdmi_drive=2 and hdmi_group=2 settings, needed for my monitor. I also have hdmi_mode=23 (1280x768 in hdmi_group=2). Yes, I found that woofQ was running 'ldconfig' too soon in the build, before /opt/vc/lib was installed. Fixed. On the Pi2, just run 'ldonfig' in a terminal, that fixes it, OpenMAX hard accel then works with the video player.